CoolSculpting is quickly growing in popularity as a non-invasive option to Liposuction and is currently deemed as the #1 non-surgical fat reduction treatment. This is likely due to the high satisfaction ratings of clients with 79% reporting a positive difference in the way their clothes fit! CoolSculpting freezes fat cells, effectively eliminating unwanted fat in the treated area. There are no special requirements that coincide with this treatment, such as crazy diets, exercise programs or supplements. The results are noticeable and natural, and can be seen in as little as one treatment (although most clients will require at least two treatments for optimal results). CoolSculpting actually kills fat cells, meaning that once they are eliminated, they are gone for good! This is the only FDA cleared treatment that uses cool temperatures to eliminate unwanted body fat. CoolSculpting treats excess adipose tissue on certain areas, effectively eliminating stubborn body fat. It is a great option for lose looking for non-invasive body contouring options. CoolSculpting uses a safe, precise and controlled technology called Cryolipolysis® to safely freeze adipose fat cells. Once the treated fat cells are frozen, they die off over time and are naturally flushed though the body's natural elimination process. CoolSculpting targets the fat cells, not the surrounding tissue, making this a safe way to induce lipolysis - the breaking down of fat cells. Technically speaking, when an adipose cell dies, it goes into a process called apoptosis - a natural, controlled cell death - which leads to the release of cytokines and other inflammatory mediators that gradually eliminate affected cells. These mediators then work to digest the adipose cells, flushing them through the lymphatic system (urination). Who is/is not a good candidate for the CoolSculpting? Because CoolSculpting is a non-invasive means to fat reduction, just about anyone can be a good candidate for this procedure. This fat freezing technique is not meant to be a means of weight loss or a solution to obesity, but rather an option for those needing help to remove fat bulges not easily reduced by diet and exercise. Those needing a larger reduction in body fat should consider Tumescent Liposuction or a more invasive method. How many CoolSculpting treatments do I need? Everyone is different, so the number of treatments vary person to person. You will notice a difference after one session, but you'll probably require at least two treatments for optimal results. Be warned, that once you see the amazing difference on your treated area, you will want to come back to treat other areas! Where on the body can CoolSculpting be done? 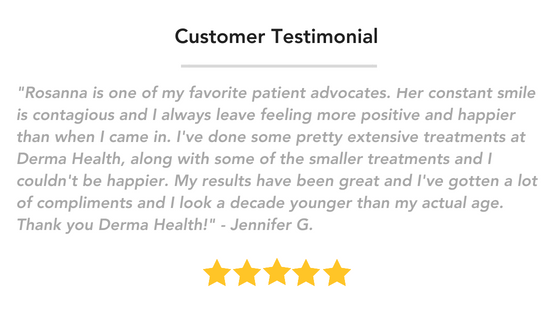 At Derma Health, we take every measure possible to ensure a comfortable experience. As the name suggests, you will likely feel a cold sensation as the gel patch is placed on your target area(s). This cold feeling will likely subside within 5 or 10 minutes as the area becomes numb (and we will give you a warm blanket and pillows to ensure you are comfortable). Vacuum applicators are used to draw in the fatty tissue, so you may feel a slight pulling, tugging or mild pinching. How long is the CoolSculpting treatment? The number of areas being treated will determine the length of the treatment, however, each area typically takes about one hour, once the process has begun. Derma Health is unique in that we offer two CoolSculpting machines in each clinic, effectively cutting your appointment time in half! Without two machines, you would need to stay an additional hour for each area. For example, instead of treating upper arm fat in two hours, we can treat both arms in just one hour. You are certainly welcome to multitask during this appointment. Many clients bring along reading material, streaming video and all sorts of things to stay occupied. How long do the CoolSculpting results last? One of the greatest things about this fat melting option is that the results are long term. Once the fat cells are destroyed, those same cells do not come back. With regular weight loss, due to diet and exercise, fat cells only shrink, however the number of cells remains the same. With CoolSculpting, the treated fat cells are removed, thus greatly decreasing the possibility of weight gain. This is not to say weight gain is impossible, however, there will be fewer fat cells available to expand for weight gain. You will first meet with a patient advocate at your desired clinic location, where a custom treatment plan will be crafted for you. You will then be scheduled for your treatment (sometimes your consultation and treatment can be conducted on the same day). Before the treatment begins, we will take pictures of the treatment area for comparison after your treatment, as well as take measurements. The area will be thoroughly cleaned and then the gel applicator pad will be placed on the skin. Then, your laser technician will attach the applicator to the machine and your treatment will begin! There is no down time associated with this treatment, however, patients have recorded feeling tender in the area for a few days post treatment. Immediately following the treatment, you will likely experience some redness and swelling, which will begin to subside. Also, because the surrounding skin is kept cold for the duration of the treatment, it is not uncommon to feel numb in the area for a few days as well. The most common side effects of CoolSculpt include temporary redness, swelling, blanching, bruising, firmness, tingling, stinging, tenderness, cramping, aching, itching or skin sensitivity. Everyone does respond differently, so you may or may not experience some of these side effects. In clinical trials and in treatments, all of these symptoms subsided naturally within days or sometimes weeks. If you have any concerns at any time, reach out to your clinic for clarification! At Derma Health we recognize your needs are unique. Therefore, we offer all patients the opportunity to make an appointment for a complimentary assessment to understand your goals and concerns and talk about the treatment options and combinations that will give you the most optimal outcome. Derma Health Skin & Laser offers the most competitive pricing on CoolSculpting in the Valley. Regarding payment, we have various options to fit your needs and budget. We accept cash, debit cards, all major credit cards and we offer two types of easy approval financing. To learn more about financing or to apply online click here.